TC 9.22 x64 on Windows 7 x64. Old laptop with a 5400 RPM 7200 RPM hard drive (not sleeping). I have an inactive tab which points to a directory with ~2500 files and is sorted by date. I have two color filters, one for NTFS compressed files and one for files which contain any descript.ion comment (tc comment regex .). None of the files match the color filter criteria, if it's relevant in any way. Now when I click the tab, it takes about 5 seconds 20 seconds to show the files. For comparison, Everything shows all ~700 thousand files on my hard drive sorted by date instantaneously (no color filters of course). Is there any way to make reading and showing the contents of this tab faster (save for buying a faster hard drive / SSD)? Try disk defragmentation via right click on the drive letter in TC - Properties. Thank you. The analysis says the disk is 0% fragmented but I will give it a try anyways. Until then, any other ideas I might try as well? Turn off icons and compare results. Hmm, good idea, but all files are *.txt files so that shouldn't be a problem. I'll try anyways. Also it seems I have underestimated the read time by quite a lot in my original post, since after defragmentation it is ~20 seconds for a directory of ~2500 *.txt files (sorted by date, no matching color filters) and ~5 seconds for a directory of ~700 *.txt files (same criteria as the previous dir). Is it possible that the disk has trouble reading sectors or is even dying? 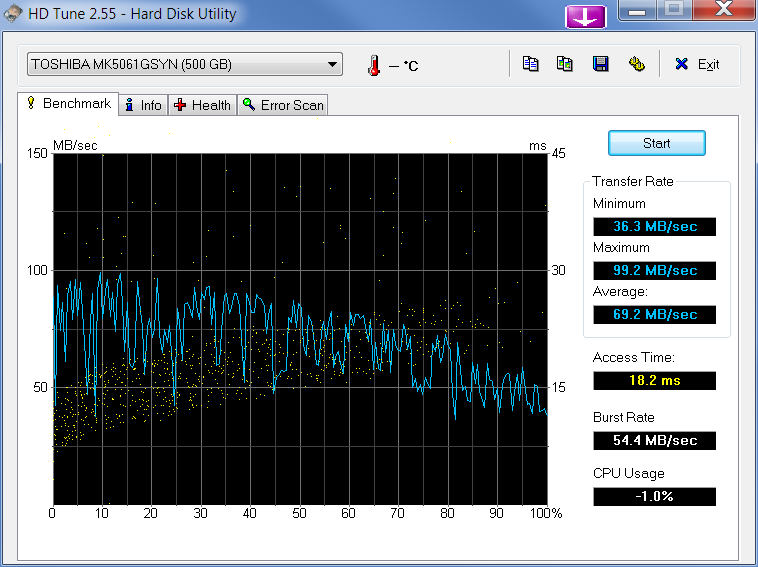 Take a look at the SMART values with CrystalDiskInfo and maybe check the (theoretical) performance with HD Tune. These are extremely slow read times even for a hdd! It's possible that defrag didn't do anything to the directory because the fragmentation level was too small. I have signed it with my certificates now to show that it's authentic. I have already written about it many times. TC is not adapted to read large directories, and in particular with small files, where speed drops drastically. But is real? It will not help, the speed will not improve. Although you can try, and the results are always deplorable. Disable showing icons in TC, should in some ways help, but all in all: There are tools whose icons do not affect speed. Thank you for showfrag. For both the 20 seconds dir with ~2500 files and the 5 seconds dir with ~700 files it shows "Number of fragments: 1". I do not really consider a dir with ~2500 files especially large. HD Tune looks more or less OK, I guess? So it seems the issue might be with the really low random read / write speeds? I have considered disabling the antivirus and testing, however, seeing these values for read and write speeds I don't think the antivirus program can be the reason (since I don't think it would affect random read / write speeds but not sequential ones). Any ideas what might be causing such speeds, anyone? CrystalDiskMark doesn't make much sense for a HDD because it mainly benchmarks random I/O where HDD are really really bad at. So, I won't give much about that. What is more important IMO is the inconsistency in HD Tune benchmark. The graph should have less ups and downs. Did you exit any programs and background programs before benchmarking? And, what's worse: 53°C for is definitely too hot for an HDD! You need to do something about that. That's why GSmartControl also says that it this attribute failed in the past, meaning that it got above some threshold defined by the manufacturer. CrystalDiskMark doesn't make much sense for a HDD because it mainly benchmarks random I/O where HDD are really really bad at. The graph should have less ups and downs. Did you exit any programs and background programs before benchmarking? No, I tried to perform the benchmark under the usual load conditions. I will try to run it on a system as clean as possible and post the benchmark. 53°C for is definitely too hot for an HDD! You need to do something about that. There is not much I can do about it, it's in its usual place in the laptop. On one hand there is no special ventilation, on the other hand there is no dust buildup either. Nice oven, the drive will not work so long, and there may be speed problems. Maybe - by analogy with the above-mentioned self-written program(showfrag) from the author - he should write a test utility for scanning the selected "point" from the file system structure with measurement of the time spent? Using the same functions/approaches/techniques as Total Commander usually does. And so we can immediately find a bottleneck? it's just that I have never met a situation once, as makinero rightly pointed out above - that some third-party actions with HDD would help to increase the speed of processing by Total Commander folders/files. Thus if Total Commander immediately does something on the disk slowly - then it will always do it slowly - especially with a large number of files and/or directories. This HDD is TOSHIBA MK5061GSYN, 500 GB, 7200 rpm (that's why it's so hot). It's most likely Advanced Format HDD (with 4 KB sectors) running in 512 byte sector emulation mode (partitions are misaligned). And what with an older TC version ? ie TC9 or TC8 ? Is it particular to TC 9.22 ?